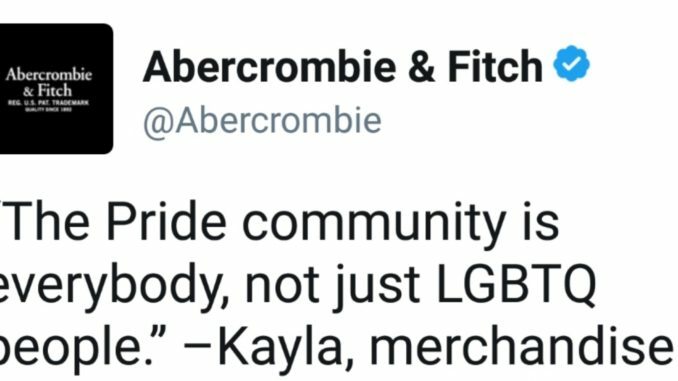 Abercrombie & Fitch ruffled a few feathers after their tweet about gay pride and they’re making no apologies for it. 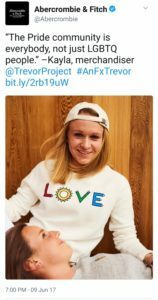 The failing brand isn’t exactly known for being LGBT friendly… or Black friendly… or anyone who isn’t the epitome of an “All American cool kid”. 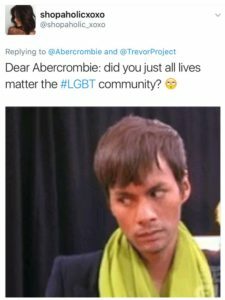 Just googling the name “Abercrombie” with “racism”, you’d think the two were synonymous. A&F models and staff alike have reportedly accused the brand of being sexist and racist. Just last year, A&F was labelled “the most hated retail company”, due to having the one of the worst customer satisfaction rate in history and due to their operating income plummeting from $72.8 million to $15.2 million in just one year. Former CEO Mike Jeffries said the brand was never meant to be inclusive, because some people just don’t belong.